This 5K run is a special one for me. 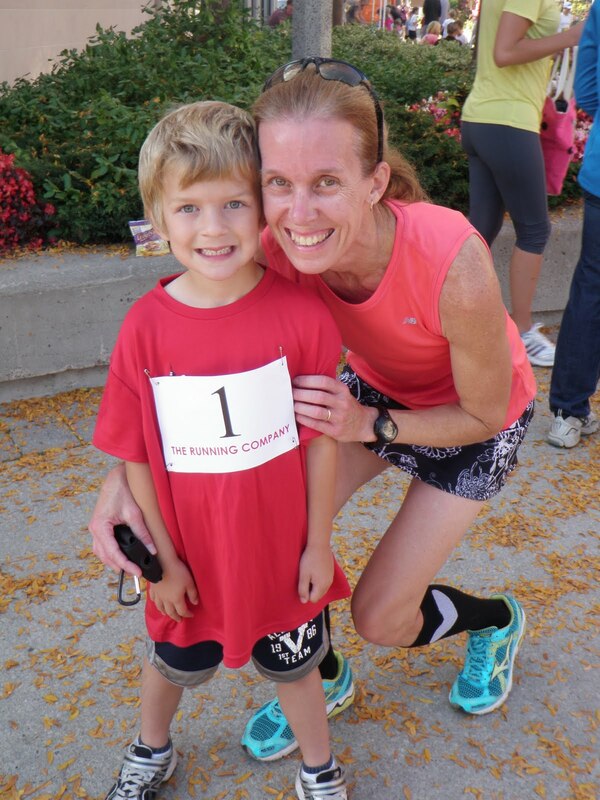 A lot of that has to do with it being so close to home, being one of my first successful races after a long absence from running (pregnancies and sick kids will do that to you), and simply being for a good cause – to support the Kerr Street Ministries. This year, the race has become one that is very close to home as, back in January, my husband volunteered to take on the role of Race Director. For the past several months, and especially over the past few weeks, planning the race seems to have taken over our lives. On a positive note, though, Hubs has been more inclined to come to races with me to promote his event and see what is going on at other races. Behind every successful race director is a supportive spouse but there was no way that I was going to give up the opportunity to run this event to help him out on race day. For the past year, this was a target race for me – the race where I was going to push for a 20 minute 5K. That plan changed when I was out for the summer. However, since running again, I looked at the 5KSM as a chance to push myself, to see where I really was in my training after being off for more than 8 weeks. I actually studied my 5k times for the past year, and I planned my pacing. I thought that I should be able to run 21:30 – half a minute slower than last year’s race but over a minute faster than what I was running a few weeks ago. Instead of counting sheep in bed last night, I thought about splits: 4:15, 8:30, 12:45 – no, that might be too fast. 4:18, 8:36, 12:54 – too much to think about during a race. But with this morning’s bright sun, I wasn’t able to see the time on my watch anyway. All I could see was the glare from the sun’s rays. So, I did what I tend to do anyways: I ran by feel. And I felt terrible. Somewhere between the first and second kilometre, my left hamstring tightened on me; all I could do was run to loosen it up until I was ready to push again. Just before 3K, my quads felt ready to burst – likely a result of Saturday’s 8 miles and Thursday’s interval session with Shawn. Yes, looking back, rest would have been a good idea if I wanted to truly be serious about today’s race. Truthfully, I suppose I wasn’t worried about today. All I really wanted out of it was a good time – literally and figuratively. And my time was good – 21:31 (or 21:26 if you believe in chip time) – and I placed 8th female. What really surprised me, though, is that I placed 4th female in my age group, 40-49. It’s true; that group of women is becoming one of the most competitive groups running. And I had a great time figuratively. But that’s tomorrow’s post. Still an amazing result! That is a tough age group!